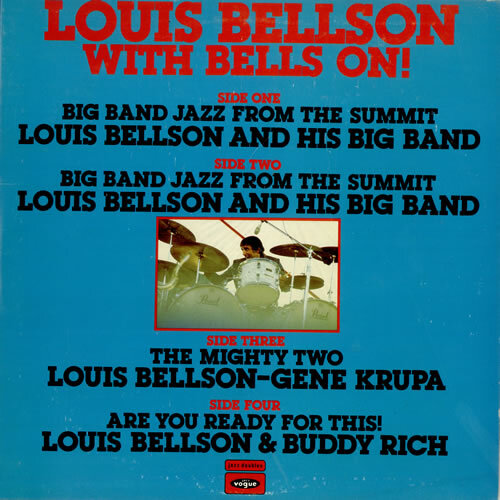 LOUIE BELLSON With Bells On! (1979 UK 22-track double LP, capturing three explosive performances from LA ['The Summit', Jan. '62], NYC [May '63] and Tokyo [Jan. '65], including a drum battle with Gene Krupa [NYC] and a 28 minute head to head withBuddy Rich [Tokyo] entitled 'Slides and Hides'. The gatefold picture sleeve is excellent and both vinyl discs look barely played VJD564).